It is always fun to hear a professor introduce their own course on the first day of class since there appear to be two types of introduction possible: a confession that the course is not so interesting but we will try to make the best of it, or an endorsement that this course is one of the most important things you will learn. 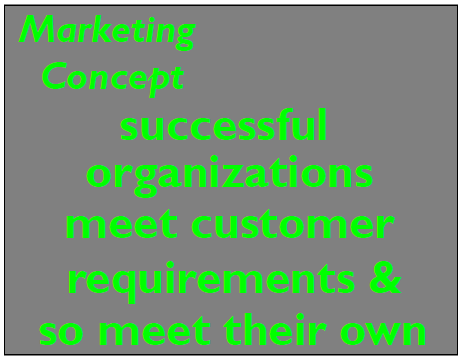 For the Marketing 1 course professor Ian Fenwick gave the second type of introduction, but to his defense there are more professors who have admitted that besides the course they teach also marketing would be important to a company. 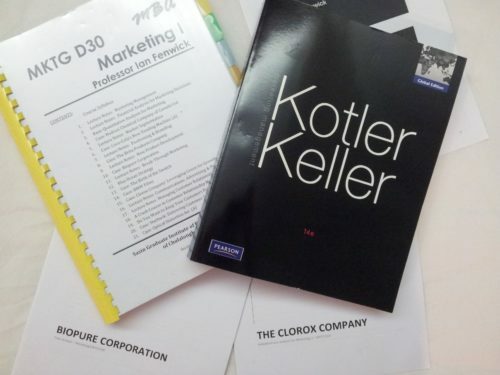 Reading material and cases for the course Marketing 1 with professor Ian Fenwick. 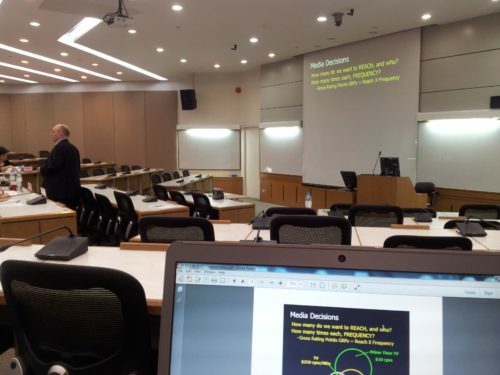 Similar to Business Strategy the teaching of this course was partly based on case analysis and case discussions. We also had to make one case write-up as a group, for 20% of our grade, and one case individually, for 35% of our grade. Since there was no particular structure being presented we just held on to the structure given during the Business Strategy course meaning every analysis I wrote started with an internal analysis followed by an external analysis, the problem identification, and recommendations. Unlike most things we hand in at Sasin we got, to my surprise, some very decent feedback on the cases we wrote meaning we could actually learn something from it. 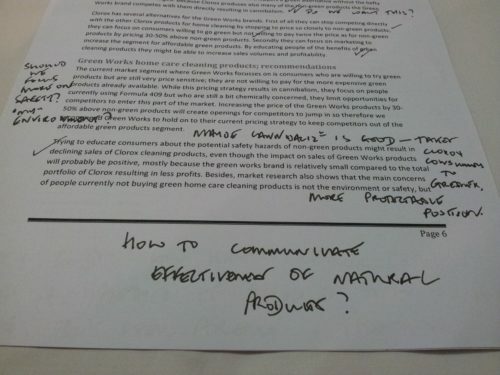 Normally the feedback only consists of a grade or, after repeatedly requesting it, a point score, but in this case we got the write-up back with notes of the professor in the margins. Almost every assumption was circled in case you did not explain where you based it on, and questions were asked where appropriate. I am very happy with this kind of feedback since there is nothing as annoying as spending a lot of time on a paper and having the feeling the professor just glanced over it before giving you a grade for it. Detailed feedback on the Clorox case analysis we had to write. Instead of just a grade we got some feedback we could actually do something with. In class a lot of examples passed by of companies that succeeded very well in their marketing, and of course the companies that failed miserably with new products or commercials. The slides seemed to support the story told pretty well but when we finally started studying for the exam it became obvious they were not very structured meaning we had to form groups to go over them and try to recollect what the story behind the slides was. For the exam we had two hours and luckily it was open book and we could use our computer to write the answers. While I had good intentions to keep the answers short and to the point, I soon found out that this is quite impossible since the questions asked on the exam were pretty open. You could go any way with them and there was nowhere an indication given how many differences between two methods we had to give, or how many examples to support our story. For me this means that I write down a long answer, and when re-reading it I always get doubts if it is clear enough and if I covered everything so I add some more here and there. Answering question 1 already took me one and a half pages so I hope the professor is looking forward to reading a lot coming weeks when grading our exams.